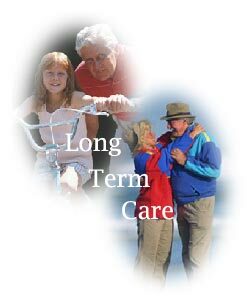 Why is Long Term Care Insurance So Important? You never know when you might need long term personal care, which can be very expensive. Long Term Care Insurance, just like any other type of insurance is easiest to obtain when you're still relatively healthy and younger. If you wait until you’ve been retired for a couple of years and are developing a condition where you might already need regular care, trying to find a low-cost long term care insurance policy will be harder than trying to find a needle in a haystack. Long-term care refers to the many services beyond medical care and nursing care used by people who have disabilities or chronic (long-lasting) illnesses. Long-term care insurance helps you pay for these services, which can be very expensive. A policy also ensures that you can make your own choices about what long-term care services you receive and where you receive them. People are living longer and longer these days. That's great news, but the flip side of that is there are more years in which there's a risk of serious health problems which could literally cost all of your remaining life's savings. Unfortunately, ordinary health insurance policies and Medicare usually do not pay for long-term care expenses. Medicaid, a federal/state health insurance program, will only pay for long-term care if you've already spent most of your savings or other assets. Medicare is the federal program providing hospital and medical insurance to people aged 65 or older, and to certain ill or disabled persons. Only in certain conditions are benefits available for home health care. Generally, Medicare may pay for up to 100 days of care in a skilled nursing facility per benefit period – 100% for the first 20 days (after a three-day hospital stay, if skilled care is needed). Then, from day 21-100, Medicare requires a co-payment. A Medicare Supplement insurance policy can help cover the co-payment, but often once Medicare stops paying for care, the supplement payment ends as well. Medicaid (in California referred to as Medi-Cal) generally pays for certain health services and nursing home care for those with low incomes and limited resources. Medicaid may also pay for some long-term care services at home and in the community. Medicaid limits your assets and monthly income before you are eligible for benefits, and restricts transferring assets to qualify for Medicaid. Eligibility and covered services vary by state. Help in your home with daily activities like bathing, dressing, eating and cleaning. Community programs, such as adult day care. Assisted living services that are provided in a special residential setting other than your own home. These services may include meals, health monitoring, and help with daily activities. Care in a nursing home. When is the right time to buy a policy? Many people don't think about long-term care until they get into their 70s and 80s and their health begins to fail. At these ages, you may be too high a risk for an insurer to cover you; or if you do qualify, the premiums can be astronomical. In fact, some long-term care policies have restrictions on age and health status. The best time to buy long-term care insurance may be middle-age. It's the time when you have the highest likelihood of being eligible for a policy and, just as important, when premiums costs might be lower. Is a policy right for you? Long-term care insurance is probably not for everyone, but—with soaring health care costs, insurers increasingly restricting coverage and eligibility, and people's need to stretch retirement savings through more years—it's a good idea to consider it seriously. Your goals should be to protect your assets, minimize your dependence on other family members, and control where and how you receive long-term care services. Coverage: You can choose long-term care policies that pay only for nursing home care, or only for home care. Or, you can opt to purchase coverage for a mixture of care options that includes nursing home, assisted living, and adult day care. Some will pay for a family member or friend to care for you in your home. Daily or Monthly Benefit. The daily or monthly benefit is the amount of money the insurance company will pay for each day or month you are covered by a long-term care policy. If the cost of care is more than your daily or monthly benefit, you will need to pay the balance out of your own pocket. Benefit Period. Your benefit period determines the length of time you will receive benefits from your policy. You can choose a benefit period that spans from two to six years, or the rest of your life. Elimination or Waiting Period. During this period, you must pay all of your long-term care expenses out of your own pocket. This period could last anywhere from 0 to 100 days. The longer the waiting period is, the lower your premiums will be. Inflation Protection. With health care costs rising to new heights every year, buying a policy without inflation protection is probably buying a policy that won't cover much of your expenses. There are two main kinds of inflation protection: the right to add coverage at a later date; and automatic coverage increases. Non-Forfeiture Benefit. Policies with this benefit will continue to pay for your care even if you stop paying premiums. This policy feature can add 10 percent to 100 percent to your premium. Clearly explains when you will be eligible for coverage and how your eligibility will be determined. Does not require that you spend time in a hospital before receiving benefits. Will be renewed as long as you pay the premiums. Lets you stop paying premiums once you begin receiving benefits. Has one deductible for the life of the policy. Automatically covers pre-existing conditions if you disclosed them when you applied. Offers choices for inflation protection including an automatic increase in your benefit on an annual basis or a guaranteed right to increase your benefit. Allows you to downgrade your coverage if you cannot afford the premiums. Provides at least one year of nursing care and home health care coverage. Allows the right to cancel the policy for any reason with 30 days of purchase and receive a refund. Increasingly, long-term care involves providing a level of medical care from skilled practitioners to address the often multiple chronic conditions associated with older population groups. The goal of long-term care insurance is to help you maximize your independence and function at a time when you are unable to be fully independent. A plan for how to deal with long-term care is paramount given the health care issues facing Americans today. These issues include Aging populations, Family lifestyle changes, and Evolving health care and a lack of adequate protection from healthcare costs. Long-term care insurance offers protection against the risks associated with these issues. Acquire Financial Services is affiliated with leading carriers nationwide where our clients can benefit from the latest in Long Term Care Insurance resources. We are your one stop shop resource for Long Term Care Insurance and we make Long Term Care Insurance easy!